If you love chocolates, this might be of great interest to you. This weekend, take a break and appreciate the best food in the world ( we are talking about chocolate aka food of Gods!). From desserts to shakes and cocktails — the secret ingredient in all the best dishes has be either cheese or chocolate. Dark, white, milk or mix — chocolate loving can come in many ways and we discovered ours at the Fabelle, ITC Sheraton. So to begin with the basics, you need to know that the chocolate origins from cocoa mass which is also 100% pure cocoa and has no sugar. It tastes kinds bitter and a lot of people won’t prefer it eating that way. The percentage of chocolate that we often read in descriptions is an indication of the cocoa present in that bar. When you go to buy chocolate, just remember — the higher the percentage of cocoa, the lesser the sugar content. 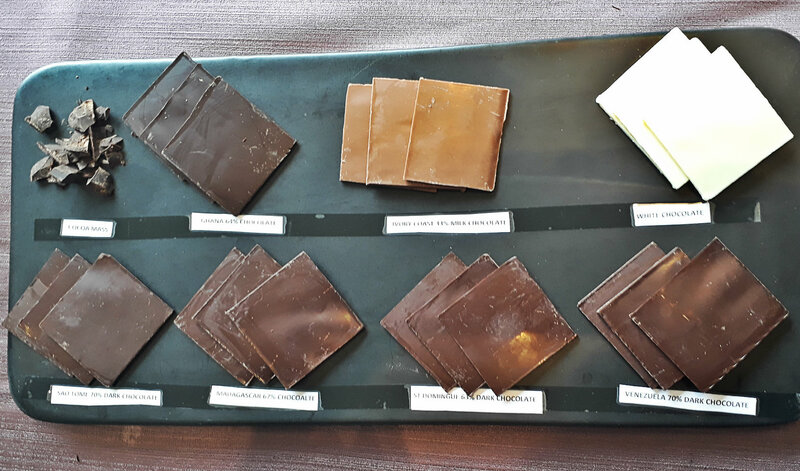 The dark chocolate will have cocoa content between 70 to 50 percent, whereas milk chocolate will have more sugar and fat and 30 percent cocoa. Whereas, white chocolate is made of milk solids, sugar and cocoa butter. A bar of couverture chocolate costs higher as it contains cocoa butter and melts very easily (the fat is derived out of cocoa beans and light to digest). Whereas, the other varieties are made of palm oil and can be stored at room temperature. Let the chocolate set in room temperature for at least minutes after you take it out of the refrigerator. It blends easily and tastes much better with tea or coffee when it’s not frozen. Just like wines, chocolates are also classified on the basis of the origin — how cool is that! Single origin chocolates are grown in tropical regions like Madagascar, St Dominique, Venezuela and other parts of Africa and South America. Pair these chocolates with jasmine tea, coffee shots, and green tea to enhance the flavours of flavonoids present in the cocoa. All we can say is that there is nothing like too much chocolate. So, enjoy while it lasts.